"Suzume-neesan, why are we going to see the pretty girls?" The yamabushi would giggle at the boy's question. The five year old boy at her side going by the name of Kazuki, with its brown hair looking rather scruffy and the simple clothes depicting him as nothing higher than the commoner class fit well with the woman that was holding his hand. She had once been a member of a higher class, remainders of that still visible in the way her black hair shone with health and the way it was put up in a mixture of pragmatism and elegance, but the tattered brown and gold haori and hakama set had seen better days. Patched in various places, the high quality once befitting her status was now nothing better than that of the local beggar. And it could be heard. Through the beautifully decorated hanamachi, the geisha's street where one tea house connected with another, the well-dressed women found it an amusing display to see two 'beggars' wander through their street. "We're not going to see the girls, young man. We're going to find a geisha willing to perform a tea ceremony for us." "I admit it needs some getting used to, but a man without culture is not any different than a barbarian." "Is it now? Then I guess you'll be fine since you've drank plenty of tea with me." "Then your lesson is to pay attention to the finer hand movement of the geisha and the diligence with which she serves you tea." She'd nod sagely, leaving the boy slightly confused as what she meant with that. So far the yamabushi had not found a willing geisha. Those who stood outside were merely giggling as if they were jesters, reserving themselves for finer clientele which would fit their cultured establishment in mind and in looks. Eventually, she would stop before a singular tea house. Amid the beautiful buildings that made up the hanamachi, this building seemed sober in comparison. Elegant in its simplicity. Also... closed? And yet it drew in the yamabushi's attention who felt this building was due to a chance. Dropping the need to find the most beautiful exterior, she believed to have found the one tea house that harboured not the beauty but the spirit of the geisha. "Suzume-neesan... This one looks so ugly." "Do not perceive beauty with your eyes, Kazuki-kun. True beauty is perceived with the heart." And so she'd take a step closer, hoping the tea house would be open to guests. Sat in the hospital rooms armchair, her right hand cupping the side of her bare, mutilated left hand. Her right hand's fingers resting against the back of her left hand as her thumb absentmindedly grazed over her palm as she started off to the opposite corner of the hospital room, an Intravenous therapy drip dangling from the back of her right hand. The sensation of feeling trapped eating away at her mind as she went over the memories of the few days leading to the Tsuchikage and his squad leaving Iwagakure to head to Sunagakure with a political agenda and the hopes of a new alliance with the newly appointed Kazekage. She needed to peace it all together, something had to stand out, some small detail that would give her a clue to finding the seventeenth Tsuchikage, Sekuro, Karumo. Again and again, she would run over the memories, from the assassination attempt on the Tsuchikage to witnessing him walk through the back door led by Teegya to inform her of the venture along with her promotion to chunnin. The images flickering through her mind in a quick succession would sit heavily in her throat, weighing her chest down as it welled with sorrow. Her right hand would shift to clutch at her chest, her brow creasing and her eyes closing tight as the image of the Tsuchikage battered and bloody passed through her mind. The steady beeping of the room kicking up harshly as it set to an irregular tone. Her body would arch forwards as she pushed from the armchair only to crumple to the ground, her left hand swiping to catch herself in part as she landed against her forearm, tearing out her Intravenous therapy drip in the process, the tube spilling the contents of the medication held within the drip along the floor. Her body shaking violently as another somewhat louder beep set in, squeezing her eye tighter shut. Her hand would reach out to the Tsuchikage bearly a few feet away as they lay upon the ground, the blood trickling from his lips, his body torn to ribbons, outstretching her fingers, even against the spasm of pain with her movements, an attempt to graze her fingertips down over his features, the gesture the same as she had often given with the others of the orphanage. The imagery of that far worse than any from her time held captive. Pushing up from the ground, her eyes would peel open, her vision clouded for but a moment as the room began to come into focus again, the dull sounds of the room becoming louder, the thundering sounds of footsteps coming closer. Grasping the bed she would push to her feet her body kicking into overdrive. She couldn’t stay stuck in this room she needed to act, too much time had passed she needed to start searching. Her hands no longer fumbling as they tore the ambu white sensory patches from her arms, chest, stomach, and hips. The beeping switching to the sound of a flat line. Yet by the time the doctors would arrive in the empty room the window open wide, mere seconds had passed yet she had collected her belongings and were already scaling down the side of the hospital building, placing her weapons to their rightful places before tugging her glove into place, fiddling with the fingers to ensure the stump of the missing digit would have at least a bit of comfort. Her mind made up, she needed a place in which to keep not only herself but her findings whilst seeking out the Tsuchikage and only one place safe enough came to mind. Her grandmothers Okiya. Upon being promoted she had also received private word that she had inherited not only the that which her grandmother had owned but also the lands that she had possessed since she was the last of their families line left alive. The main property being the Okiya like all else hadn't been touched since her grandmother's death nearly months after that of her fathers. Sock and grief quite possibly being the culprit. Yet she herself had only visited the Okiya at most three times previously as a very young child she remembered where it was with unspeakable ease. Slipping around the outer edge of the village to avoid as many people as possible, mainly anyone that might recognize her, keeping her head down, the right side of her ice white hair shielding her face from view she would head to the Hanamachi. Stepping along the streets of the Hanamachi the sounds and scents, so familiar yet foreign at the same time would drag some of her oldest memories to the forefront of her mind as she slowly her way past the many Ochaya as she headed towards the Okiya district only to come to a pause before a run-down building of which the steps a clear image of a young boy clambering the steps came into view before disappearing. Stepping closer she would look up at the building could it really be? The symbol of Jashin set like a crest above the doors, calling her home. Yet the building itself was in dire need of repair, especially when compared to the buildings around them. It would be the voice of a young lad that would draw her from her pondering. A smile would crawl along the visible section of her lips, causing her cheek to crease and the two indents of scars on her lip’s to deepen as a soft chuckle spilled forth from them. Their interaction with the ochaya would be interrupted by a young woman's voice replying to what Kazuki had said. Both Mizuki and the boy would stop and turn around to watch the approaching presence. Kazuki's eyes would grow big when he laid eyes on the well-dressed woman, perplexed at how the many clothes and ribbons turned her into a pearl walking the dirty street. At his age, the boy was truly enraptured by the artistic elegance. Mizuki, on the other hand, was a shinobi herself. Her trained eyes would catch more than just the masterfully applied clothes. The Iwagakure headband notifying her of her affiliation. The tessen presumably her weapon of choice, smartly left in plain sight to subvert suspicions from its actual use. Not being from Iwagakure herself, other than the Jashinite emblem which she recognised from Kumogakure where it had started to pop up all around the Village like mushrooms, she could not identify the kamon on the clothes. That all being registered, the bow she was given from the Iwagakure lady would be returned in kind, the yamabushi pleasantly surprised that she wasn't the only one having been raised with culture, making her wonder if the kamon related to a family of equal stature of the Raiu family to which she actually belonged. "No harm done. ", she'd reply as she bowed towards the Iwa shinobi. The boy, seeing as how everyone suddenly bowed, snapped out of his mesmerised daze and briefly bowed as well. More to mimic their behaviour than to truly understand the meaning of respect behind it as his uprising at the hands of his parents had been limited. He didn't want to be rude, after all, even if his cheeks coloured a soft pink when he heard her say he'd do well to pay attention to the yamabushi at his side, but this sort of culture was not something he was used to as he originated from a peasant's family. "Is she a geisha? ", he'd whisper to Mizuki, as if the stranger before them would not be able to hear them, upon which he somewhat crawled behind Mizuki. It wasn't that he was shy otherwise but... perhaps he was a little shy around the stranger. Maybe. Mizuki would flash him a smile in response. The woman made advances to enter the building, apologising again for wishing to step in before them with the intent of opening the house. "A good question, Kazuki-kun. We might know the answer as soon as we allow her to enter this ochaya. ", she'd reply as a hint of her intention, stepping aside as to lead by example and opening the road to the Iwa-nin to continue hers. She'd return the bow again in apologies for having barred the road. Kazuki would quickly shuffle out of the way as well, glancing between the two women and bowing again to follow their behaviour. All this bowing and apologising seemed to confuse him, his young mind not too sure what the point was when no one was harmed so far. "Pardon our intrusion. We were hoping to discover if the ochaya was open for visitors willing to partake into a tea ceremony. ", Mizuki would clarify once the Iwa-nin had accepted their apology and continued her path to the tea house. She would incline her head ever so slightly in response to the female’s words, allowing for the chance to take in the females attire, the nobility in her movements, yet what nobility did she hail from that would see her this way now? To the child by her side, his attire more fitting to how she had been so much more comfortable in her youth. Yet As she took the moment to analyze them and the oddity of such presents within a hanamachi district her attention would be drawn back to the child, her single piercing yellow orb would flicker to rest with him, her sharp features softening at his words, her smile remaining in place even as her gaze returned to the female. A pang of pain and longing making its way through her stomach, possibly even the sensation of homesickness, her mind for but a moment returning to the orphanage she still classed as home yet had not given words for them of her return. Keeping her left hand’s remaining fingers curled slightly with her hand angled towards her body to shield sight of her missing digit from view as her right hand brushed past the tessen tucked into her obi at the front to simply retrieve a set of heavy looking keys of various sizes and makes, some well kept and others chatty and … bloody? Stepping closer as she caught the young women's hint, a subtle limp in her step if her weight rested on her left side for too long, evident to well-trained eyes. She hadn't planned to pause on her way to the okiya, not even to check the ochaya within her heritage but alas it had been her that had interrupted the two and such compelled her forwards towards the ochaya. When was the last time she had climbed these steps? She would thumb through the keys pausing at one that held the look of pyrope garnet, its handle intricately woven into the shape of entwined vines. As she stepped past to the door her left hand would naturally move to rest against the door as she slipped the key into the lock, speaking with her movement, “I am no geisha, once I had the honor of being a mahiko. I am but a humbled shinobi. There has been no intrusion, though I must apologise again, I haven't a clue when the last time this Ochaya opened its doors for service and do not know of its condition inside...” the click of the lock would signal that the door had unlocked with ease, her left hand would shift to the handle, her sleeve shifting again, now to cover over her hand for the most part. Looking back to the two her smile would remain, “But you are both welcome to step inside with me and take a look around.” Ignoring the disgruntled and appalled looks given by those about her attention would remain with the two, her smile only warming further. “Have either of you attended a tea ceremony or performance of a geisha or mahiko before?” She would press her weight slightly to the door before sliding it open. A moment of silence would pass as the Iwa-nin moved her hands to take out a set of keys and advance to the door with a hint of a limp. Perhaps it was strange to note this only later, but the small details which revealed themselves with every passing moment betrayed that the kunoichi before them was worse for the wear than she let on. The story behind the wounds eluded Mizuki, who could easily assume it related to the Siege of Inabayama or related friction between the Nations, but she could only admire the young woman's composure who suffered the scars in silence. The sad truth about an event that should not have taken place to begin with, orchestrated by forces few could rival. Her own thoughts were interrupted when the girl stated she was not a geisha but a shinobi. Mizuki knew this already but the boy's eyes widened. Shinobi! How awesome! "You must be really fast and strong then! ", he exclaimed in amazement. Little did the boy know that the yamabushi at his side was a shinobi in hiding, her true identity still unrevealed to him even though he knew she was fast enough to catch fish with her bare hands. Perhaps the Iwa-ANBU would be aware of her presence since she had come in touch with the Tsuchikage not too long ago to have Kazuki hospitalised. Harichimo had met Mizuki years ago during her mission to make the black raiton clouds known back when he was still an ANBU, so the man could have known about her true identity. If he did, his actions and behaviour had not revealed any of this to Mizuki. She was just as much left in the dark to what intel Iwagakure had about her when it came down to truths. "Kazuki is inexperienced with tea ceremonies or performances. As part of his upbringing I wanted him to experience the refined cultural etiquette that comes with it. I would be grateful if you would allow him the chance to learn from it." As the door slid open under her weight, the boy would peek inside with innocent curiosity, Mizuki moving her left arm around him to somewhat rile him in as he was almost about to tumble inside in his eagerness to see what it was about. The reminder of her clash worn by her hand, which were minor 2nd degree burn wounds, with the two Kumo ANBU that had coincidentally found her in the Valley of Mountains were somewhat visible. Herbal balm created from an old recipe Lin had once taught her had been applied, carefully covered by a bandage to protect it against the environment. The wounds were healing slowly but in the meantime the movement of her hand and fingers were not as refined as what they usually could do. Once the Iwa-nin would step inside, Mizuki would follow with Kazuki, taking a look at the area that revealed itself to them. Her gaze would follow the child’s into the building yet she would not miss the sight of the woman's hand as it coiled protectively around the boy. Naturally, her gaze would set into the building before stepping over the threshold as her mind wandered over the female's wounds, from what she had glimpsed of them, re-evaluating the details of the female even as she spoke, were this woman a shinobi like herself? If so such were well hidden, even from the child at her side. Her mind would shift to the difference between the two, each detail depicting the difference in status and living classes, such reminded her of when the orphanage gained a new arrival and how each within reacted with and about one another accepting so many into their makeshift family. Taeru would reach up to strike a match as her free hand reached to lightly grip at her chest for a brief moment, lighting one of the candelabras on the wall before dropping the still lit match into the thin trail of oil that would travel to ignite the lights further along the entrance room, casting out the darkness and bringing the simple elegance of the reception room into view. Fashioned in white walls and black trim, exquisite paintings lining the walls whilst statues of marble, garnet, jade and celestite trimmed with gold and rubies sat about the room depicting Geisha and their Dana to the Mahiko in training, to larger statues set the same depicting flowers and gods alike. A small desk sat off at an angle with a single statue of a medium size beside a candle and inkwell. Te stature somewhat resembling Taeru herself yet depicted a long passed relative, a great great grandmother of her own grandmother. Yet to say she believed it had been years since anyone had stepped foot inside the building and repair was required, there was no dust no visible decay, only a simple elegance and a fermillair scent clinging to the air. Once deep enough inside she would turn on the spot allowing her kimono to pleat against itself as she waited for the two to enter alongside her. “It would be my pleasure to share the experience with the both of you. Please, do come in and I shall find out if we are able to perform one here, otherwise, we can choose from one of the many Ochaya within the hanamachi. None will deny entry.” turning back to look about the room searching through her memories of the building to locate where the items for the ceremonies were kept, yet the memories of a mere child were all she had to work with. Stepping to the slide doors past the small desk she would again tug the door open showing a slither of a room decorates much the same as the reception room from what could be saw, yet were the main ceremony room. "You sound like Suzume-neesan. ", Kazuki said with a frown. "She says I need to train hard too if I want to catch fish with bare hands, but I just want to have some fun." Mizuki's eyes would sparkle in amusement. It had not been that long since she had showed how to catch a fish with bare hands and then since he had tried to do the same. Never too long since he grew bored quickly of his own lack of speed but every day he had tried catching a fish as if sleeping a full night would somehow bring him closer to his accomplishments. The boy was still young. A little too young to discipline his mind like that of a swordsman but old enough to plant the seeds that would eventually bloom into comprehension. "Beauty and Art is achieved by cultivating it. Everyone trains hard to become great at what they like to do, Kazuki-kun. They pour their heart and soul in what they believe in." They'd step inside the building after the Iwa-nin did, the two of them laying eyes on its interior. The boy did so with eagerness to slake her curiosity, considering the visit more like an adventure as he explored the vast world. His young mind not quite open for the finer details of the artistry, he found the place nonetheless marvellous to behold and decided that the tea house looked better on the inside than the outside. It probably looked better than any other tea house now, too, since the woman at his side had said something about beauty being in the heart. Or something like that. The young woman would eventually turn around to welcome them, telling them she was willing to perform for them and share the experience. She also offered the option to find the experience elsewhere but Mizuki raised her hand and shook her head. "That'll be fine. This place spoke to me. Now that I see how rich it looks on culture and stories, I'm certain it will be the perfect place to enjoy a ceremony. ", she'd reply with a respectful bow towards the young woman whom had led them in. Whereas the child looked through the eyes of a young boy still trying to understand the world in fullest, the woman at his side allowed her blue-green eyes to glide over the finer details within the reception room. The white walls and black trim gave the area a sober look, leaving the attention to the portraits and statues that decorated the room. What the tea house lacked on decoration on the outside was certainly not the case on the inside, the wealth of the tea house owner apparent in the exquisite paintings. Though the frames of the painting were pieces of art worth admiring, the vast amount of different hues that had brought the paintings to life spoke about the painter's eye for detail. The artist that had allowed his brush to stroke the canvas knew how to capture life. The statues were nothing different. The marble geisha looked all too real were it not for their pallid stone skin, the gems adding the finer elegant touches that befitted these artists. Artistry about artists. Mizuki smiled before she caught Kazuki standing a little too close near a frailer looking example that stood on the adminitration desk. "Be careful not to break anything, Kazuki-kun." "I'm just watching. ", he said despite taking a step back. He certainly didn't want to the shinobi to be angry at him. He'd turn about, talking to the maiden as he pointed with his finger to the statue looking like her. "This statue looks like you." “To catch a fish with bare hands?” Her features would play the art to match the turn in her voice as though curiosity peaked her, yet such simply didn’t reach into the hues of her orbs as her gaze flickered to the elder of the two as she spoke before shifting her gaze back to the child, “What a talented companion you have.” Her head would incline in a deep nod that caused the bead of her hair to tap harshly against her chest as she straightened, the hollow sound like a dull thud radiating within the air. The action to show that she understood the woman’s stated reasons for picking such a place. She would return to standing beside the desk as though she was playing the part of the receptionist for the time being as her gaze shifted between the two as the child explored the room only for her gaze to return to the female, evidently she had little care for if the child knocked anything, her attention simply watching the female take in her surroundings, the chance to study the female further wouldn’t go to waste, something to occupy the forefront of her mind as a smaller part wondered when the last time the tea house had been stocked with tea’s and the like. Had it been a decade or more since her grandmother had passed? Had the tea house continued to run past that? She was sure to find out soon enough. Only when the female spoke again would her attention return to the young boy that had drifted closer. Watching him step back and his exclamation of her resemblance to one of the statues would withdraw a soft chuckle from her lips. Her form would lower drawing her knees to the hardwood of the floor to draw level with his gaze, her right hand shifting to the statue to turn it slowly as she spoke, “It was modeled after a long passed relative if she were anything like my grandmother she was strict.” As she stood she would leave the statue askew as she continued to speak, “Not so long ago, when I was younger than you are now I broke it.” she would lightly tap what remained of a crack only visible from the side she had turned it too, the evidence clear that it had been repaired so that from the front nothing seemed amiss whilst the back showed evidence of the damage. With her smile softening she would straighten her form to the correct posture once more. “If you both would like to step this way, I apologize for the lack of a receptionist please allow me to direct you.” Her left hand would shift from its place at her stomach to spread outwards indication to the door she had placed ajar whilst her elbow remained tucked against her side, before returning her hand to its place beneath her right, resting at her stomach. Having chosen a distraction for the two so that she would be able to at least procure some tea, she simply needed them to step forth. Mizuki's eyes sparkled in amusement at the compliment of the talented companion. While it was true that catching a fish bare-handedly took some skill, sometimes it was easier to grab the fish straight out of the river than to find the patience to wait half a day for one to take the bait. Even if she had all the time in the world as a yamabushi, free of responsibilities, patience was not always a given when one was starving and living off the land. "When living off the land, the need for survival teaches many skills." The alternative was dying but there was no need for such heavy words. Mizuki was fairly certain the kunoichi before her understood that all too well by her own without the need to be reminded of this. Neither did the young boy before her, who had lost his parents at the hands of bandits, be reminded of such memories. Kazuki's curiosity got the best of him. A child not knowing much restraint at the young age of five. His statement remained rather innocent despite and was awarded with a short story about the statue. A strict relative and a clumsy moment. The statue had been patched and kept despite the remains of a crack that betrayed its unfortunate experience. Now imperfect, it remained a beautiful decoration. While Kazuki didn't put much thought into the words, brushing it all away with an, "I still like it. ", as if his tastes about the statue could make or break its existence. Mizuki wondered if the Iwa-nin sheltered a similar upbringing as her own. Strict relatives, being taught an art of traditions, bearing the expectations to continue and sustain a certain heritage. Mizuki was supposed to be the sensei of the Raiu dojo continuing the teachings of her father's Heaven Sword style ever since her father had died at her own hands. Was the young woman pushed into a similar fate? Raised and expected to continue a tradition despite the difficulties to combine it with her shinobi nature? The shinobi apologised for the lack of a receptionist, requesting them to follow her lead. It was somewhat to be expected that the locked house would not have everyone in place but the persistent absence of people was slowly pressing through. The whole building seemed empty of people other than the three of them, Mizuki's ears not catching much of movement or general noise of life within the immediate surroundings. "That's fine. I'm grateful you are willing to do this for us." Kazuki and Mizuki would step behind the young woman leading them into a new section of the ochaya. The boy tilted his head to the side, hoping to catch a glimpse of the new room well before Mizuki did, childlike's curiosity getting the better of him. A hand resting on his shoulder, the boy understood he was not to simply run in but wait his turn until the woman guiding them would continue revealing more secrets of the ochaya with every step. “It is my pleasure.” Her smile would remain as she turned to return to the door leading to the main ceremony room. As she approached she would reach out with her left hand allowing the three remaining fingers to curl within the grate like handle of the door before tugging it open to allow them passage. She would indicate for them to enter as she stepped out of the way before remaining in place like a true hostess, once they had followed her she would step behind them to usher them into the room, her hands would feather softly graze against them, against the child her hand would brush his shoulder as for the woman, her hand would brush the center of her back. Though at a usual standard the shoes would have been left by the door she would brush that fact aside and continue. Once in the room, it would expose the interior. Again, decorated just as the reception room yet the paintings here stretched out along the walls depicting the sight of a Geisha and Taikomochi with their Dana walking and the Mahiko entertaining within a beautiful garden, with a small stream and a red brust bridge to cross it. Many statues decorated the room just like out in the reception room, yet in here there was a raised platform that took up around seventy percent of the room. A set of thin and somewhat see-through sliding doors stood at the far end whilst just off to one side was a small low table enough to seat a small part of people. The cushions fashioned as seats would very clearly bare hand-sewn embroidery similar to the style of kimono Taeru herself wore. The detail of the black silken cushions done in a pearl-like white with a ruby red setting. Whilst the low table, itself like a statue, beautifully carved mahogany brought to Tsuchi no Kuni from Hi no Kuni, yet few now may recognize such. Stepping into the room she would indicate for them to take a seat before closing the door in which they had entered before shifting towards the music box. She would lower to her knees before starting up the music. As the music began her gaze would flicker to the two watching them intently. A figure would approach from the other side of the doors upon the platform section of the room. With a fan in hand, the figure would remain on the other side of the doors each of the figure's movements would hold a grace unparalleled outside of the Hanamachi, in perfect tune with the music. The doors would slide open. For the child, this would seem as though they had been opened yet for his companion it would be a mere ghost of an action, like watching a thin veil of events ensuring that the female could still see all else that was truly happening within the room yet held a glimpse of what the child saw. With the doors opened by two kneeling shadows, a proud, elegantly dress male would be revealed, a Taikomochi in all his glory. The male easily representing not only the statue up front but Taeru herself, save for his tantalizing green orbs, his age easily pit around the same as Taeru. His dance would proceed with the music, elegant, flexible and in an odd sense alluring in parts, as he depicted his own form of battle, the fans in his hands his weapon within this dance. Taeru would shift to beside the woman, “I will seek out some tea, for now, this is the best I can offer. I cant after all leave you without entertainment nor can I entertain whilst you both are without a beverage.” Her voice would bearly carry over the sound of the music, meant for the females ears only. If permitted she would stand and exit the room quietly by the door of the side of the table, using the time to seek out the necessities of a small tea ceremony. As she returned with a tray bearing the necessities of china cups a teapot and an oval plate baring small sweet cakes. Upon her entry, the music would wane and the Taikomochi would turn before exiting through the doors, allowing the doors to slide shut behind him. She would set the tray on the table before seating herself before them on the opposite side of the table. “I do hope that orange blossom tea is okay?” she would speak as she poured out three small cups, placing one before the female then the boy then herself. As she placed the plate of cakes down before pushing the tray aside the soft shuffling would emit from the music box, such sound would find in unison for the doors to open once more, two beautiful Geisha would enter both carrying their instruments. Settling upon the platform they would begin to play, the music box would make up for the sound yet though the vision it would seem as though these specters would play for them, one wielding a Koto and the other a Shakuhachi. Cooldown: Time maintained + 3 posts. Description: The caster activates the genjutsu through a single touch (The touch can be as simple as brushing shoulders, this counts even through clothing), or within the line of sight of the caster (if activated by line of sight the caster must form a half U [hare] hand sign). Once under the genjutsu the caster may implant an image/sight. Such image/sight varies depending on the casters choice this can be continues and changed. (For example the caster may chose to give the image of a battle scene one time and the next a simple memory of a flower.) The image/sight's are implanted by the caster therefore this jutsu even effects those that are blind. This jutsu cannot be broken by pain if activated via touch. The host would lead them inside the next section of the oyacha, standing on the side so they could step inside. Mizuki removed her shoes before entering, an old habit from the many years she lived home in Kumogakure and trained at her father's dojo where this was a habitual ritual. She had to inform Kazuki to do the same as the boy, who was not used to such finesse and remained eager to see the new section, was unaware of such little cultural rituals. He quietly followed suit despite, little bare feet resting upon the floor now that he had removed his shoes and stepped inside the ceremonial room. A hand would brush his shoulder as he stepped in, the boy not paying it much attention, before it brushed Mizuki's back. The room fell neatly in line with the reception room, the colour of the walls remaining the same throughout the entire room. More pictures depicting the typical members belonging to the artistry of hanamachi revealed themselves as geisha and taikomochi now graced the different backgrounds of their own world. Kazuki would smile brightly, glad he'd finally get to see what this was all about, moving forward with his guardian as the Iwa-nin indicated them their place. Having set his eyes on the cushions, the idea of sitting snugly was a welcome gift as the yamabushi and the boy generally sat on hunted furs rather than the comfort of such luxuries. Yes, to the boy this was pretty much a gift he knew would never be given again. Amazed appreciation would twinkle in his eyes as he proudly looked at the two women when he took seat on one of the cushions, Mizuki returning him a warm smile before she'd courteously bow before Taeru in thanks for the allocated place. Then taking her seat on another cushion close to the boy, Mizuki would sit in seiza and wait. "What's going to happen now? ", Kazuki whispered, picking up the quiet expectation of respect the ceremonial room naturally imposed upon its visitors. His question would be answered by the Iwa-nin as she allowed the music box to set the mood. The genjutsu implanted within both of them with a subtle brush would come to life, the images of a dancer coming to stage, fan in hand, only being recognised as an illusion by the yamabushi. The boy's gaze would turn to watch the dance, eyes eager to pick up every detail as he remained unaware of the mind trick. Understanding the situation, Mizuki would follow suit as she allowed the genjutsu artistry to persist, admiring the meticulous craft of a well-done illusion in favour of cultural amusement. The theatrical illusion was despite the relative weak level of the illusion a marvellous piece to behold that expressed the knowledge and experience of the crafts brought to life by the illusionist. The position of the hands and feet, every subtle movement of the body and the use of the fans. The intent came across clearly from the moment the man entered the area through the doors and all the while as he danced. Mesmerising, from the way Kazuki quietly followed the imagery in awe and the way even Mizuki eyes followed up the position of the taikomochi in quiet observation. The subtle movement of the Iwa-nin would not be registered by the boy who was completely caught in the genjutsu but Mizuki would slightly turn her head to lend her ear as the young woman spoke about her predicament. Mizuki would nod slowly in understanding, allowing Taeru to proceed without the need to burden herself in the situation. The yamabushi had already understood the situation of the tea house being empty, not wishing to make it harder than it already was. By the time she returned with the tea, the music came to an end and the taikomochi would leave the scene. The boy would snap out of his trance, a little disoriented as he suddenly found Taeru preparing the tea ceremony. "Orange blossom tea is a fine choice. ", Mizuki would accept, the rich aroma and taste of the tea being pure indulgence. It was not her prime choice as the Raiu preferred more subtler tastes but the symbolism was fitting for the occasion. A moment of indulging in luxury was a welcome break of the otherwise sober lifestyle both the boy and the yamabushi endured in the Valley of Mountains. "I've never seen a man dance like that", Kazuki would interrupt to share his amazement, unlocking a nod of confirmation from his guardian. "Indeed. Your taikomochi brought us an exemplary performance." "What's a taikomochi? ", Kazuki would ask with a puzzled expression, knowing only about a select few mochi. "I believe they are the male counterpart to geisha, Kazuki-kun. ", Mizuki replied to the boy before facing Taeru herself. With an expert in the field, it would be rude not to request confirmation in respect to their elevated knowledge on the matter. "Is this correct?" Giving a soft inclination of her head at the confirmation of the tea being at present, acceptable, she would continue. Once the cups had been distributed she would raise the teapot to pour into each cup, filling them almost to the brim, first the female’s then the boys before filling her own, yet for her own, she would fill only half way. The colour of the tea would hold a very pale orange colour like that of pale honey, the scent it gave, evidence of how fresh the tea itself was. Orange blossom tea being one of the most commonly used during both training and first time running of a tea ceremony, alongside first time attendees often being from the age of a youth, the sweet taste appealing more to the younger generations in comparison to the more experienced, used also to lighten the sense of a room. She would listen to the two, their conversation allowing a smile to crack the pursed concentration of her lips, it felt like a lifetime since she had heard the word Taikomochi spoke aloud in the national tongue. She would carefully push the trey to one side using her middle and index fingers of her left hand before resting both hands against her own cup allowing her right hand's fingers to overlap her left hand save for her pinky that would meet the cup with a light tap. Giving a soft nod as she was encompassed within their conversation, “Yes, Taikomochi are at the origins of the Geisha’s art and were around long before a female took up the art form.” Her head would tilt a touch to the side as she set her yellow orbed gaze on the young boy allowing a fair amount of her attention to settle on him, “Every performance that is made, from the Mahiko, the Geisha and the Taikomochi is like a story brought to life with their movements...What story do you think our Taikomochi was telling us?” Years of being a part of one of the local orphanage had taught her that if attention was given in full it could at times encourage a youngster to not only come out of their shell but blossom with the thought trails offered up before them. As they conversed the music would continue to play through, seemingly at the hands of the phantom geisha atop the platform, giving a soft lull in the background, fighting off the silence of the rest of the premises. Her gaze would flicker to the women at the boy's side. In this place of which she had known discomfort in training with such arts by the hands of strict teachers, she now found an odd comfort in the simplicity of the tea ceremony and the company that sat before her. Especially after recent events. A wave of sobering gratitude would find space within her chest and for the time being, no matter how short, the weight from her shoulders would rise, like finally taking in a breath after beings submerged at a crushing depth. OOC: I apologise for how long it has taken for me to reply. The two guests would wait for the tea to be poured out. One patiently, the other not as much as he fidgeted on the cushion in hopes to taste the origin of the rich orange scent he was smelling. From the way he didn't instantly grab his cup of tea once it was poured out, eyes instead following the teapot until it was set down it was apparent that the boy had been taught some basic manners. Not quite those befitting the savouring of a tea in a ceremonial way, but a child his age was hardly to be blamed for not being as refined as the two older members participating in the ceremony. Once the tea was served and the pot set back on the trey, Kazuki looked expectingly for a sign of Mizuki that would allow him to indulge his thirst. She'd give him a slight nod before gently taking up the cup with both hands, one allowing the cup to rest in her hand while the other created a protective screen as it to shield it against outside influences. Seemingly sinking into a brief meditation as her eyes perceived the purity of the tea, nose gently taking in its scent in full, the yamabushi allowed her mind a moment of repose as awareness for the tea house, the area and the world around them seeped into her mind. Once she felt she had sufficiently welcomed and accepted the universe's existence she would take a measured sip, allowing the sweet taste of oranges to tease her palate and the warmth of the beverage to chase away a non-existing cold from her body. At the same time, Kazuki would pick up his cup with both of his hands, blowing softly against the liquid to cool it off so as not to burn his tongue and took a healthy sip to quench his eagerness and curiosity. Of meditation and connection with nature was not the slightest hint to be caught, the boy already feeling was putting up the best of his effort to remain calm and patient as it were. Taking in the tea's warm liquid, his eyes would widen at the sweet taste, lips curling into a bright smile as this tea was not only a better drink compared to what they had in the Valley back home but had also been dubbed his favourite tea to boot. Nothing would rival the taste of the geisha's orange tea, ever! His attention would be grabbed by the question she asked him. What did he think the story of the taikomochi told him? A pensive look would cross his face, eyes staring into the orange tea cup as if the beverage would whisper him the answers he was seeking. They did not come, the ripples in the tea leaving on his own to search for the solution. "Nee-san says it takes a lot of practise to become good at something. He looked really concentrated, so I think he wanted to say dancing is difficult?" A simple answer holding the truth inherent of a child. The dance the taikomochi had performed looked difficult to in the boy's eyes. A lot of effort was put into getting dressed and performing the show with the fans. Stealing a glance in Mizuki's direction, she'd probably say something about practise making perfect or how training was needed to become great at something (even though he hadn't needed practise to be great at playing games :T), but the woman's eyes seemed absorbed by the tea, only her ears picking up what he'd say. Like she always seemed to do. "That is correct, Kazuki-kun. Practise makes perfect. ", she'd say with a bemused smile. He'd nod sagely since he obviously could predict Mizuki's answer on the matter, but lend his ears to the tea mistress nonetheless. Curious to hear if he was right about what he said. The smile still in place, her head would right itself once again. Her left hand would shift, the three fingers curled to her palm loosely before pressing the back of her middle and index fingers to the edge of the place of biscuits before sliding the plate close to the two. Her left hand would return to her cup allowing for the fingers of her right hand to rest atop the left once again, however, the cup would remain against the table. Her gaze would flicker between the two for a moment taking the opportunity of a short pause to think of the structure of her question before speaking, her accent just as heavy as before, “Would I be right in saying that the two of you don’t originate from Iwagakure no Sato? I myself do not, but it became my home quite some years ago now.” her yellow orb would come to rest with the female. Though the origins of the two interested her, simply asking outright would be too impolite, yet inquiring and possibly finding the reasons of for being within Iwagakure would come to light? The two after all, though had seen better days, it stood out that they were of two different social classes making for an odd pairing. However the thought had passed through her mind as to whether the young women had adopted the child from one of the orphanages about the village, yet such thought only brought forth a longing to return to the orphanage she had called home for so many years. The brightest beam of pride would be visible on his face when Kazuki heard he was correct in his answer, sharing this instantly with his guardian who granted him a warm smile and a peck on his head as reward for an answer well thought off. Victory, in a world way beyond him to comprehend just yet, was his. From all that thinking, he'd reward himself with another sip of the orange blossom tea and nod with full confidence when Taeru asked him if the dancer had done a marvellous job. Yes, yes. The dancer clearly had danced very well. Like a second reward, a plate of biscuits would glide onto the table between the tea cups. Eyes growing big at the prospect of sweets he'd look at the two girls around him in hopeful confirmation that he could claim himself a well-deserved reward for his right answer. Mizuki would take one biscuit and grant him his reward by placing it in his open, expecting hands before taking one for herself. With a light bow towards Taeru, she'd speak. "Please, do not hesitate to partake in the biscuits. Our host you may be but I would not like you to feel excluded in this small ceremonial gathering." Perhaps this offer was not the traditional way of performing a tea ceremony but the yamabushi had long since dropped the more rigid traditions of her father in favour for maintaining a sense of harmony and balance. Even should Iwa's tea ceremonies harbour a different etiquette, the young woman preferred to express her open mind rather than to keep it reserved. The benefit was fully at her side, after all, for who would expect a yamabushi to know proper etiquette anyway when they were dressed in the torn remains of a brown with gold haori and hakama. It might have been coincidence as much as her offer of sharing could have been the weight tipping the scales to nudge the Iwan kunoichi into asking a question of a more personal sort, backed with the diplomacy expected of an artist of her nature. Even then, knowing already that the young host was a shinobi, Mizuki was not all to surprised when she had deducted both of them didn't originate from the Valleys in actuality. Artisan and shinobi, two different worlds sharing one and the same trait - an eye for detail. "Your astute senses have not failed you. ", Mizuki confirmed. "We reside in the Valley of Mountains now but both of us come from different areas. Kazuki originates from the Land of Grass, whereas my own roots lie deep within the mountains of Kumogakure." Two different people from completely different classes, indeed. Kazuki having travelled with his parents, simple commoners of the working class hoping to find a better life in the fertile mountains of Iwagakure. Mizuki, a member of Kumogakure's oldest shinobi clans with a fleeting lineage traced back to a ronin samurai. The Arashihime could have lived in the luxury of her clan's wealth, continuing the legacy of her father's reputation. Instead, she discarded it all in search of enlightenment to find her way back in the violent storms created by the black raiton god Hastur. "I, too, fell in love with the environment and warmer culture of this land, having wished to settle here in past dreams." She'd take a measured bite from the biscuit, the confection cracking as it broke between her teeth. Kazuki had somewhat lost of his prideful smile as he heard the name of his former home, the recent events that had brought him here too fresh and too strong to be conquered by his previous victory. Mizuki would comfortingly rest a hand on the boy's smaller hands. "I worry our past events are not as warm as your kindness. While I would like to believe you are fortunate to have come here earlier than I did, I could not help but notice you carry your own form of pain. Perhaps our meeting was not a mere coincidence"
The soft smile would remain along her lips, just enough so that the visible scarring on both the upper and lower lips would indent yet not crease as it had when laughter had caught her outside of the building, returning the light bow before speaking, “I hope you shall both forgive me for not partaking in the confectionaries.” and yet as though there were to be more of her sentence, or so it would seem, she would fall silent for a moment as though the language itself failed what she had wanted to say, before she would continue, “Truth be told, this is the first tea ceremony I have been a part of in a very long time, and whilst one of many it feels for the first time that I am partaking. And for such, I thank both of you.” grazing back on the pillow a touch she would release the cup placing her hand against her knee, her right hand atop her left before inclining her body forwards, a bow in kind, such that one might show not only from gratitude yet also respect before drawing her form upright once more. As the female spoke again she would nod, yet her gaze would flicker to the child as the energy of the room shifted at the mention of his previous home. Yet the women would continue until her peace had been uttered aloud. 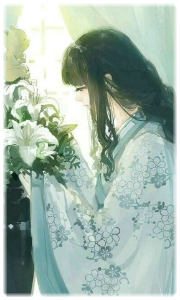 The sadness that radiated from the child would raise the finer hairs on the back of her neck as such drew forth memories of her one youth before finding her way to sanctuary within Iwagakure no Sato. The sadness could not simply be from leaving a home and a land behind, no such had to be far deeper, otherwise, his keeper would not be from a land far from his own and of such a different social standing. Her gaze would flicker to the table as the shift of the woman's hand to the child’s would draw her thoughts back to the present as she stored the women’s words away within her mind, locking the information away for use or insight at a later date. “I apologise for my question ad the pain of remembrance that it has brought back.” The depth of her apology would set as thick as her accent, the subtle touch of a word only just translating to the common tongue as though the depth of her words couldn’t simply be translated into the common tongue. Yet a single word could easily encompass the pain of loss, toska. Yet at the mention of the women’s notice of her physical standing her sharp gaze would flicker to her own hand and for a moment she would condition her features to remain neutral before drawing her head back up settling her single visible orbs gaze on the women’s, her head would tilt lightly to one side causing the bead within the hair that framed her face to tap against her collarbone with the movement before speaking, “Kindness has the ability to go a long way. I came here to stay as a child with nothing and the village opened her arms to me with the embrace of a motherland, adopting me into the village’s life, giving me food, shelter and family made of many, each and every one had come from something similar. Maybe if such it chosen, this land could do the same for the both of you.” she would pause, the small movement of her right hands fingers would brush against the back of her left hand before softly stroking over the stump of where her little finger had been, as though it would give her the words to speak, “Physical pains heal or fade quickly enough with persistence. My wounds are old yet still, require time to fully heal.” Her tongue would flicker against her bottom lip, coating its quickened dry state in a subtle layer of saliva before continuing after swallowing, “See, my squad and I had been tasked with a mission of diplomacy in the Kaze no Kuni, we failed before we could even try to complete the mission, the others are gone and I were taken, yet the information in which they required never did reach the ears of such captors, you understand.” Though an uncomfortable topic the information itself, for the most part, was common knowledge for many moons from the absence and disappearance of the seventeenth Tsuchikage, Karumo Sama, and just maybe, giving may well lead to receiving more information upon the two. The revelations that followed were not the lightest sort. The first time in a long time that the maiko joined a tea ceremony. It must have felt like a samurai losing their blade. Missing a part of their own soul, missing a home. Finally retrieving it. Mizuki would nod in comprehension of the young woman's wishes, offering a smile for the thanks she offered. Some moments required no words, their very existence a blessing on their own to be enjoyed. The hermit took another sip of her cup, warm fragrance spreading through her body as the orange blossom tea spread its luxurious mirth. The second one would be in her apology about the suffering she brought. The emotions conveyed through empathy would tell Mizuki the young girl had not just suffered a flesh wound in battle but something much deeper hidden from the eyes of the former jounin. A pain that allowed her to relate to the pain her visitors suffered. Mizuki wouldn't pry, feeling it was not her place to ask about such depths but would offer another smile for the compassion. "Thank you for your compassion. Some wounds take a long time to heal. ", she'd say with a small bow before wrapping her arm around the kid and pulling him close to dry his tears. Despite his own pain, he'd smile. There was no shame in tears brought forth by care for loved ones, and knowing he wouldn't be alone granted him the strength to look beyond the sadness. But Kazuki was still a child, bearing wounds even an adult would have hard to suffer. Leaving his head resting against his 'sister', he'd indulge in the sense of protection the yamabushi had offered him since that gruesome day. In turn, their host would offer shelter in her own way with the words she spoke. Kindness. A Village offering a welcome shelter. Mizuki could only agree to those words. She had felt welcome when she had wandered Iwagakure a couple of years ago to herald Hastur's coming, and had felt appreciated all the time she had wandered in the Valley's as a yamabushi - not counting the bandits. Yes, Iwagakure offered a sense of warmth she had not seen in Kumogakure for a long time, Hastur merely embracing people to further bolster his position as self-proclaimed god. The Raikage didn't live for the Village. He expected the Village to live for him. Shaking away the brooding image in her mind, Mizuki lend her ears to the pain their host shared with them. The words revealed some truth without revealing the details. Most people would be satisfied with the explanation but the shinobi within the yamabushi wouldn't be fooled by such a simple layer of intel. She knew there was more the story, but was it her right to bury deeper? She knew little about this Iwa-nin, her squad or the rumours about the disappearance of the Tsuchikage. While the appearance of a Iwa representative during the Chuunin Exams would most likely be the consequence of this disappearance, nothing linked the girl's squad to the Tsuchikage. What she did know by the few words was that this young lady harboured a resilience of will few would match. "I'm sorry for your loss. It is unfortunate how diplomacy is often welcomed with or followed by violence. It may be but a poor compensation for your suffering but you have my respect for the loyalty you showed to your Village. ", she spoke softly with a bow of genuine respect, her own words hinting at the diplomatic mission she bore herself to herald the arrival of Hastur. A heralding she would have undone now if she so could, since it had only lead to a darker path in the history of Kumogakure. Jashinists, the race for Sunagakure, the Siege... too much, too fast the Village Hidden in the Clouds had thrown themselves in yet another warfare while barely having recovered from Sanosuke's reign and their hostilities on Kirigakure. "While I can offer little to ease the burden of your losses I may be able to restore your bodily wounds if you allow me to. Not all rumours about yamabushi are superstition." Mountain Hermits were often attributed supernatural abilities. Superhuman strength and skill, infinite wisdom, immortality, powerful healing abilities. Whether through faith or their unorthodox lifestyle in harmony with the environment, they were often the source of rich gossip and fear. Certainly, most of these were easily attributed to training and an above average health by hardships in the outdoors, but in Mizuki's case, or the yamabushi Suzume in this occasion, the abilities stemmed from year long shinobi training and the apprenticeship with Lin Katonrai, a medic expert turned Raikage before Hastur's time. Unknown to Mizuki, the last few words spoken, might also confirm what most Iwagakure's shinobi already knew - that she was not just a hermit but a Kumogakure shinobi having taken refuge in the Valleys. While it remained guessing to her true name, even that little bit of knowledge granted Iwagakure an advantage Mizuki did not have. While awaiting their host's answer to the offer, Mizuki took another sip of the tea and watched the small ripples settle down afterwards. Every word shared between the two kunoichi upholding their mundane disguises uncovered more of their truth hidden at the bottom of the tea cup. Sip by sip, layer by layer. In the eyes of the yamabushi, the road towards the future she had seen within her visions was slowly being laid bare as she was confronted with the truth of the shinobi world under a cup of tea and cookies. Her lead would lower into an incline for a moment, returning the soft bow. “If more were to share in compassion for one another, the suffering of the world would, even if only a little, be elevated. This corner of our world has been soaked in sadness and chaos for far too long, and a little compassion can go a long way.” And the more that she spoke the more her accent sat within her throat, seemingly threatening to slip back into her mother tongue, yet each of her words was perfectly pronounced and articulated. Her single visible yellow orb would remain upon the two as the female wrapped her arm around the young child, though piercing, her gaze was, it also held a warmth unmistakable and strong. One could learn a wealth of information from those around them if only they took the chance and the time to listen and observe them, truly so. And for such she would not simply look at them but watch them, to learn of them. Their mannerisms, the way each of them held themselves and spoke. The more she watched the more she would see the separate standing in social class become evident before her yet working in perfect unison with one another, like siblings. And yet before her very eyes, she bore witness to hope. For how could two find such compassion in the midsts of so much suffering, enough that one would save the other and in turn, in their own way, would become sanctuary and save the other. The information delicately passed, and would not be missed nor would the information of where they now called home and within the back of her mind she contemplated, was such a place, a place for a child with so many enemies roaming about? The thought itself would smolder on the back burners of her attention. Mizuki could only wonder what horrors the young woman had come to endure if she considered the wounds and scars she bore as deserved. Sinking in thoughts, her eyes would eyes the last bit of orange blossom tea sitting undisturbed in her cup. Few reached the ranks of jounin or lived long enough to build up a future solid enough to raise kids in. While scars and wounds were but a small price to pay compared to the many that ended up dead, Mizuki considered no wound nor scar was worth persistence of marring a shinobi's body when such wounds could be restored. But the body of the Iwa-nin wasn't hers. Her peace of mind not that of Mizuki's. And perhaps one could even say that the lady of Storms was a little more attached to the higher class than she realised. Mizuki would nod in comprehension to Taeru's wish not to be cured and shifted her gaze to the child at her side. His gaze would meet hers, she shared an encouraging smile with him and pointed out that his tea would get cold if he didn't drink it. A matter of distracting his mind from the past and pulling it back into the present where he was enjoying tea, cookies and good company in a beautiful environment. "I believe diplomacy is an art few rulers harbour. It may well be possible these men in charge would have to be taken down before any direction towards a peaceful solution would be considered. ", she picked up on the topic of diplomacy again, projecting the thought that returning home and take down Hastur was almost the only way to get to that point. Ironically, to achieve peace in Kumogakure would mean bringing war to the Raikage's doorsteps. From what Mizuki had seen during the last Kage Summit and how that raiton spear had blown up part of a mountain in Iwagakure's direction, she doubted she held the power or means to oppose him properly. At best, her endeavours would come to a stand-still, at worst the Raikage would bluntly smother them. "But is it not ironic how ideas of world-wide peace always seem to start or end with bloodshed?" Even her own travel throughout the lands as a diplomat, while intended to bring peace and unity, had only lead to violence. The missing-nin crashing the Chuunin Exams, the jashinists gathering under the black thunder clouds, the Siege of Inabayama... Could this ever have been prevented if she hadn't been Hastur's herald? But those were troublesome thoughts better left untouched. As if to drown the thoughts, Mizuki emptied her cup of tea. Her gaze would linger upon the two, the sight a reminder of a life she once knew and a lingering hope for how life could be, with the right kind of guidance. Her gaze would only pass to the teapot to give the two a moment to themselves before allowing her head to tilt just a touch to one side as she spoke up, “If you would like more tea, there is plenty, please don’t hesitate you both are more than welcome to it.” and with that she would slowly shift the pot a touch closer and slightly to one side, closest to the female so that she may delegate how much the child drank from there on out. "You are most kind. ", Mizuki said in acknowledgement to having more tea. While the maiko moved the platter with biscuits, she moved her own hands to pick up the tea with a grace not dissimilar to that of a geisha. Though Mizuki did not have the training of the geisha, it was clear she was not unfamiliar with its ceremonies, her wrist only bared as she poured in some more tea for Kazuki due to the kimono she wore being torn. The meticulous, gentle yet determined movement of her hand hinted at the possible reality of catching jumping salmon with bare hands, perceptive eyes easily tricked into believing the wind itself guided her hands rather than opposed them. A sensation easily shared with the calm demeanour of one who could oppose a storm and not have her hair be disturbed by its fury. As warm tea would refill empty cups one by one if desired, starting with the young, the lady, then herself, her gaze set on the springlike cheer of the tea flowing out of the pot and into the cups, her ears would pick up on the pieces of information shared and the questions that lingered around it. No doubt, her origins and the topic of diplomacy lead to the man who had come to Sunagakure sending priestesses to preach his divinity. First a Herald, then his chosen clergy. In the light, gospel. Lurking in his shadows, rumours of ritualistic murderers. Did Mizuki know of whom she spoke? Yes, she had been the one heralding his existence, believing he'd bring a peaceful era over Kumogakure. "Miyamoto Hastur. ", the yamabushi answered as she placed the tea pot back on the table. Her next words would be spoken as if recalling a memory, the last sentence holding a hint of respect despite her the grown disappointment she harboured for the man. "Yes, he is a man who considers himself a Thunder God. Old rumours have it he went on a pilgrimage to the Lightning Temples, destroyed the lightning caves which upheld certain traditions of old and moved on to spread his divinity. A powerful man." How long had it been since he rose to power? Two years now? Many would have since forgotten the gossip in Kumogakure as he underwent his pilgrimage. Many would disregard the explosion of the lightning caves where the Raikage trials traditionally were being held. Those were local gossip. Small fry compared to what he had been doing in recent days. The stride towards Sunagakure, the Siege of Inabayama. Mizuki wondered but one thing. Why all this bravura when the man himself had not even shown his face during the whole ordeal? Taking a sip of the fresh cup of tea, the host's words mingled with the spirit of the ceremony like a cloud of milk. Violence in in the name and pursuit of peace might be able to give a stable ground for the generations to come. Spoken like a true kunoichi willing to defend her Village to preserve the safety of the civilians. A thought that even now roamed in the mind of the yamabushi. But could Mizuki consider herself alike when she had exiled herself in search of enlightenment? Fighting in defence of Kumogakure was not the same as taking down the one power who supposedly embodied the spirit of its nation. Had he not failed to rise to the occasion when Lamya, the S-ranked Missing-nin entered Kumogakure? The destruction of the arena was visible even from the gate where she kept guard duty, the screams of terrified civilians and refugees as the Snake claimed credit for Sunagakure's destruction. Where had he been, when the Chuunin Exams were threatened by a power equal to that of the kage? As her mind remembered the first blatant disregards for Kumo's future, the surface of the tea seemed to ripple in disturbance by her troubled thoughts. "A powerful man", she repeated her words, softer this time. "Who, like unbridled thunder, leaves only ruin in his wake. But who other than the kami rule over Heaven?" The yamabushi left the question hanging in turn to see how far the knowledge of the kunoichi reached, no matter if it was in faith, strategic insight or power. All the while she'd watch Kazuki take another biscuit. A mock pout on his lip as his sadness was quietly brushed away with the promise of a confectionery goodness. Though her gaze remained locked on the females’ face, her piercing eyes would not miss the subtle movements and delicacies the female before her displayed with a graceful ease. Prowess shown by practiced hands within a world of such beautiful yet horrific art forms in which she now believed, without doubt, they both shared. The female before her though it was clear she had seen better days, the tear in her sleeve enough to show wrist though un-deliberate as such in better states would have been a show of interest from a mahiko to show that her mizuage was ready. Taeru would graze past the remembrance of such traditions, her attention taking in the women, her movements, her demeanour, the way she spoke, the use of wording if the structures of her sentences, right down to any changes, physically that were to change. The female held precision and grace that far outweighed the majority of their generation. Taeru’s gaze would flicker back to rest on the female across from her before allowing her head to tilt a touch to one side as though waiting for the child to gain permission, however, she would wait but a few moments before speaking. If the child would be allowed the geisha would guide him up onto the stage, on his way past Taeru would hold up a simple yet highly decorative practice dancing fan, having taken the item from the table that held the music player. Once out of ears shot Taeru would speak freely, simply being conscious of what graced the child's ears. However, if the child were not allowed then the geisha would bow against before raising up the stage once again to depart through the doors in which they had entered. Being offered to dance, Kazuki's face displayed a mixture of emotions. Surprise, worry, eagerness. Unsure if he was even capable, he sought to find an excuse like "But dancing is for girls..." when he was reminded that it had been a male performing the dances on stage. His eyes would carefully dart towards the stage as curiosity and eagerness prevailed a moment, then carefully they'd shift towards Mizuki as he gauged her thoughts on the matter, seeing an encouraging smile and subtle nod. A child had to explore the limits of their talents and discover their gifts in life. Feeling little opposition, he'd eventually nod in response to the offer and follow the geisha to the dance floor where he'd be given a practising fan. He'd give a last glimpse at the two women at the table, Mizuki looking back with mirth, before he'd be fully engulfed in his newfound occupation. Mizuki would return her gaze to the host before her, blinking visibly when she heard the name of her former mentor who had long since disappeared. Katonrai Lin, former Raikage. She had only briefly been in that position but the memories of seeing the young girl in that oversized Raikage vest, chasing her white panther as it ran away with her hat were recalled as if they happened just yesterday. How long had it been since she had seen her or heard her name being mentioned? To think someone else would remember her in that position... Who was this kunoichi that she know and remembered this much? "Lin-san... disappeared without word or trace. ", Mizuki revealed as a shadow fell over her countenance, taking away some of the mirth and undisturbed peace she had formerly shown. That was all she knew despite having so close to the young kage. One day, she was no longer around, Hastur already having taken her place. And though she had suspected him from killing her, she had not found any lies in his words when he said he had not needed to so such a thing. Linkage had simply vanished. As if to emphasise the memory of how Lin had once tried to rule Kumogakure, the young Iwa-nin answered with words that could only have done Lin credit. Not a god but a human should take up the position. A person with a great heart willing to rule over the Village as a mother. Kind and compassionate as she saw her kids grow up into strong shinobi, passionate and fierce in the protection of her Village and those who kept it alive. The words spoken made Mizuki wonder if this Iwa-nin had met the former Raikage once, perhaps as friend or apprentice herself. "Truer words will not have been spoken today. I can hear you knew Lin-san rather well." Her eyes would gain a distant look as Mizuki's mind lingered some more onto the words she had heard and the memories she held of Lin. Anything Lin had stood for in an attempt to undo what Sanosuke had done... trampled under the new kage's footsteps who, despite having livened up by the idea of Mizuki being his diplomat, had only turned Kumogakure into a grim fate. The Chuunin Exams, the adoption of Suna's destroyers, its zealous approach during Inabayama... But no matter how much she'd like to blame Hastur for this all a simpler, more confronting truth always surfaced. Had she not been the one who spread his name and turned him into the god he believed himself to be? "Hastur has undone what Lin-san had wished for Kumogakure and surpassed Sanosuke's reign of blind rage directed at Kirigakure. His name was spread across the Nations by a diplomat bearing his signature black raiton clouds, a so called display of his power bearing a hidden invitation to a nefarious cult. ", she began as she started to reveal the broad strokes of his impact as a Raikage, "He gave free reign to those who destroyed Sunagakure, taking two of them under his wings and allowing a third one to destroy an arena unopposed when the Chuunin Exams were held. ", the memory of the hidden Serpent revealing herself as one of the destroyers of Suna, spreading terror among the visitors and refugees that the Herald of Hastur had lead towards Kumogakure surfacing up next along the intel she had uncovered about the names that had been added to Kumo's troops - Mitsuo, Sword Saint of Konoha, and Syekren, Traitor of Sunagakure, "Jashinists spread terror within the Village under his hand, while shinobi are turned into zealots of his self-proclaimed divinity. ", she continued as upon her return the sensation of dread lingering within the streets had not gone unnoticed. Kumogakure had lost its light and was left to sink in brooding black clouds. A cult had stepped out of the shadows, preaching his name like one would generally only see within the more faithful. A cult boasting the immortality of their 'Thunder God' and that of their own, "He sent his troops to raze the ruins of Sunagakure, erase those who refused to join his ranks and further gospelled his divinity with the help of 'his priests'." The man had gone beyond hubris and arrogance. Beyond zealotry and madness. He had forsaken his humanity to become a unbridled monster wielding black thunder as his power, unrivalled by the other Nations and backed by powerful Destroyers of similar mind. Mizuki took a deep, quivering breath as her mind sank into the realisation of what she had unleashed upon the world. She had been but a chuunin back then, but even now... One mission under the guise of diplomatic peace was all it had taken to unleash this. "This is what my diplomacy has brought upon my Village...", she said, gritting her teeth as tears came to surface, blaming herself for the darkness that perpetually descended upon Kumogakure. The pressure in the air slowly dropped as if to herald a coming storm, the inheritance of her bloodline tasting the air. Nothing more, as the jounin took a deep, measured breath to compose herself again. "I have failed Kumogakure as much as I have failed Lin." And there it was, the truth of her self-imposed exile. Shame for having lacked the wisdom or strength to avoid this from happening, lessons taught by Lin twisted into a mockery much like Kumogakure had become a hollowed shell of the martial pride it used to be. As the Geisha and the young boy passed by her on their way to the stage she would give a soft nod to them, the soft smile still gracing her lips before resting her gaze upon the women, having said her par she would watch the female, seeking out each and every shift in the females features, the information such could give invaluable now. The reaction of the women once the previous Raikage had been spoke of, the reaction though saddening held the promise she now sort out. the quick flicker of shock and then pain, emotions for similar reasons that she could relate to that now showed upon the female’s features where a serene mask had previously sat. Though in many ways Taeru’s methods of information retrieval could seem cruel, this way, in her mind at least, was far more humane than her other methods. She would listen intently to the female, without the need to see pear over her shoulder to check the progress of the child, already sensing each movement not only through the genjutsu itself but from the shifts in the air from the stages direction, the two geisha had begun in their attempts at teaching the young boy firstly how to control the spin. With tears came solace. The dam keeping emotions at bay would break open, the persistent, slowly built up guilt flowing out until her chest felt no longer burdened. Into stranger's lands. At this point, Mizuki cared none. Her mentor gone, her diplomatic mission had taken away her from friends and squad members, her parents gone, her sister missing. The mountain hermit carried a lot of emotion burden, only the discipline with which she was raised preventing her from crumbling despite the solitude. The hostess' words and hands were soothing, the thick sweet scent of lilies comforting. But even then, Mizuki wondered if she had truly been that great a mother for Kazuki. Yes, she had watched over the boy since the loss of his parents but had this not been because of her deeply buried solitude? A quiet resemblance between her and the kid who, much like herself, had to go through life with few people to rely on? The years-long thought discipline and responsibility pressed upon her shoulder by her father having auto-piloted her towards actions she did not have the strength to bear? This was the reason why she had left. Too many losses she had suffered, too much changes in Kumogakure against which she had stood powerless. She smiled nonetheless at the words of Lin's unspoken pride. Perhaps it was true. She could have been proud but her mentor was not there to tell her this. Blinded by her own desire to remain strong in life despite all the fall backs, the mountain hermit could not see the tiny specks of light within the dark night. Feeling silly, she'd dip the sleeves against her eyes to remove the glistening tears. "My apologies for my theatrics. I've been so encroached into watching over others and hoping to achieve a better future I seem to have forgotten myself for far too long. ", she said softly through a smile. "Kazuki is but one child, whereas Kumogakure harbours many more left unprotected to Hastur's madness. I have failed more than I succeeded." She'd peer into her cup of tea, intending to pick it up when she registered the cold hand resting on hers just now. The cold comfort of death's caress. A quiet invitation? A reminder there was another road than the one of leaving one's heading hanging? The gaze of blue-green eyes rested upon a peaceful hand holding hers, the memories of a fierce woman roaring in the back of her mind. A mighty fist finding the cheek of a cherished person in defence of her kids, the man's head lulling to the side without opposition. Apologising. Kaminari Siri, loving wife of Raiu Kiyoshi, mother of Erisu and Mizuki. The letters on the gravestone danced before her eyes. How many years had her mother not fought a losing battle against the illness that had plagued her since birth? Had she not fought to the bitter end for the sake for her husband and children? Lin would have reigned like a mother but it was hard to rely to a young woman who had yet to reach her twenties even if the her and Mizuki's mindset were alike. Her own mother, of whom she had plenty of fond memories, was an easier reference to abide by. A woman with heart and passion. A woman who had fought against the odds to shape the future of her next generation even if she knew she'd lose the battle in the end. Placing the step stones for those to come. To think the cold caress of death's hand would now hold a message of those who had come to pass. Mizuki's eyes would leave the cold hand that rested upon hers. Drifting back to the cup, the colour of orange blossom tea so much warmer than that of pallid memories. Then to Kazuki who merrily danced upon the platform. Playful, without worry. He had be given all the time and guidance to pick up his first dance. Warmth and care, seemingly having forgotten troublesome memories of the past under a face resplendent of joy. How was she to honour their memory? "I knew there was a reason why Iwagakure appealed to me. First the genin, then the Tsuchikage Harichimo, now you. It seems your shinobi once again prove to be more humane than my own Raikage. You are right. It is highly time Kumogakure had its heart returned." Leaving the ideas for what they were, there were still a few things to address first. Like the girl not exactly having known Lin the way the hermit had done. The hostess, a kunoichi, had simply done what very few other shinobi did these days - gather information. Its value as a weapon had been proven right here and now, and Mizuki would pull out a single senbon hidden in her hair in response. Keeping it before her. "I was Lin's apprentice when she was Raikage. Lin was a great medic who tried to save many lives in the hospital, including that of my mother... But it could not be. Since you seem to be the sort of kunoichi who likes to gather information I'd like you to share with you something few others have had the privilege to see. A little piece of her soul to preserve, if you will. ", she'd explain, the senbon in her hand suddenly coming to life with a spark of raiton. "Her two techniques, the shielding senbon and the adrenaline senbon. I hope you are willing to accept this gift in thanks for your hospitality and insights shared at this table." Description: The user charges a senbon with raiton and throws it at either the upper or lower body of a person, or stabs themselves with it. This increases the reaction time if the senbon hits the upper body, and speed if it hits the lower body by 1 tier, (D-3 goes up to C and so forth). The effects wear off in two posts, and decrease the speed or reaction speed of the target by 1 tier for one post after the effects wear off. The speed of the jutsu is dependent upon the speed of the senbon thrown. If the senbon goes further than 40 meters, the jutsu is considered null. Description: The user charges a senbon with Raiton chakra and throws it either at the front or back of an ally. The user can also stab them self with it in order to create a raiton barrier capable of blocking 1 B rank jutsu, 2 C rank jutsu, or 3 D rank or lower jutsu before dissipating. This jutsu has a range of twenty meters, and is considered null if it hits out further than 20 meters. The speed is reliant upon the senbon thrown. The raiton barrier extends out 1 inch further than the target's skin, and crackles with electricity.